In the past biohazardous/medical waste was disposed of in regular municipal trash along with household garbage. After a series of serious and unfortunate events, the Medical Waste Tracking Act of 1988 was enacted. Along the East Coast of the United States medical waste, such as syringes washed ashore beaches. Also, in 1987, Indianapolis, Indiana children were found playing with vials of blood they found in a dumpster outside a medical facility. Two became infected with HIV. Waste (liquid, solid, or gas) is considered hazardous when it has the property of being flammable, reactive, explosive, corrosive, radioactive, infectious, irritating, sensitizing, or bio-accumulative. 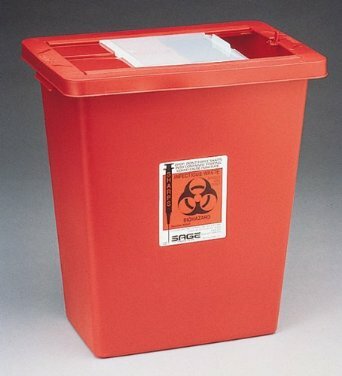 Biohazardous/medical waste has the characteristics of being infectious and hazardous. Organs and tissue from humans or animals. Feces, blood, urine or any other body fluid. Contaminated labware: flasks, plates, pipets, etc. 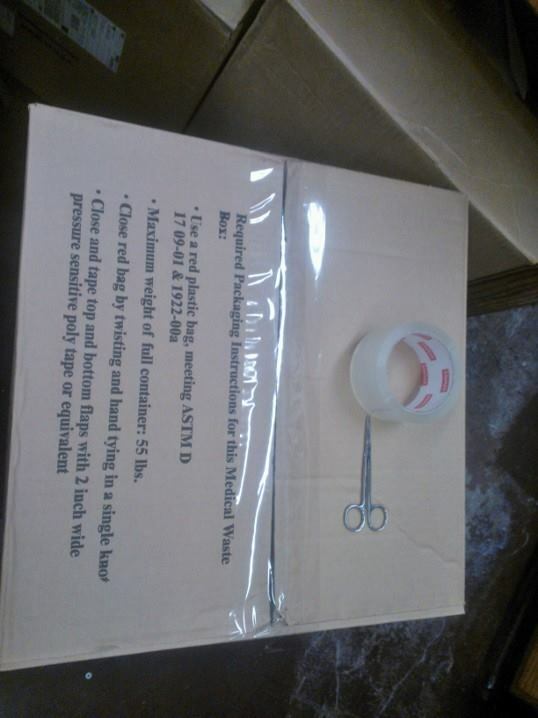 Sharps: scalpels, razor blades, Pasteur pipettes, needles, syringes. 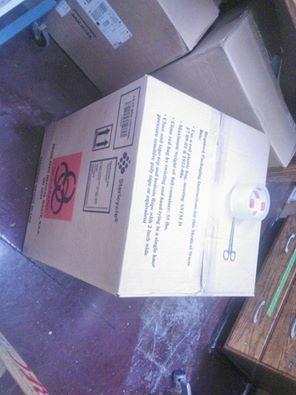 Taping up a box of solid biohazardous waste in my lab. Inside the box is a red-liner (bag) like the one shown above. The boxes are taken to a satellite area in the building for storage until Health and Safety personnel come to take it away for incineration. In my lab we place pipets and syringes in this type of large sharps containers. Sharps containers can come in many sizes from small bench-top to large floor-standing forms. Most biohazardous/medical waste is disposed of by incineration. Incineration involves burning the waste at elevated temperatures until an ash is produced. This method not only removes infectious and hazardous agents, but also reduces the size of the waste; significantly. Other methods involve various types of disinfecting, shredding, and grinding. The Environmental Protection Agency (EPA), the Occupational Safety and Health Administration (OHSA), the National Institutes of Health (NIH), and the United States Department of Agriculture (USDA) all have regulations concerning the treatment, storage, removal and disposal of biohazardous waste. I am grateful that medical waste removal is treated differently than the regular trash now. 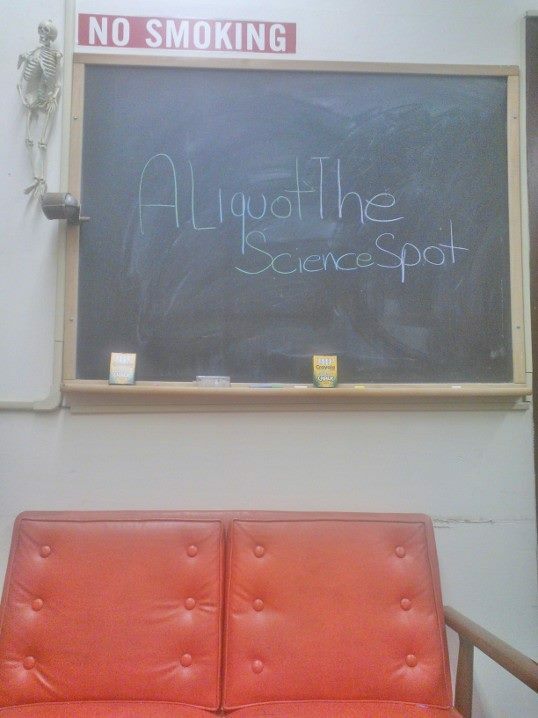 I’ve always wondered what that container is in labs and doctor’s offices. It’s good to know that they’re used for sharp objects. Do you have to have the bio hazardous waste taken somewhere to burn or do you do it on location? It is taken away, not done on site. I’ve always wondered how medical waste is disposed of. It’s good to know that different types of waste, like sharp items, liquid waste, and gas medical wastes are put in different containers. It seems like that would be important to make sure that workers can distinguish what materials are in certain containers so that they can all be properly treated. Thanks for the information!